Valve has replaced nearly 25,000 "Timebreaker" maces in Dota 2 after discovering that it was a copy of "Marchutan's Blessed Mace" from Aion. The Steam Workshop is a pretty sweet piece of kit, allowing gamers to create and share various sorts of game content like mods and models, and even make a few bucks in the process. But there are some inherent risks with such a system, too, foremost among them the possibility that people will submit copyrighted material and claim it as their own. To help combat such things, Valve requires all Workshop contributors to "promise that their contributions are original," and also allows members of the Steam community to report submissions that may violate its terms. The system works well, according to Valve, and has resulted in more than 1400 takedowns so far, but things get a little more problematic when Steam Workshop items end up for sale on Steam or in a game, and are then discovered to be violating someone's copyright. It causes a lot of headaches for all involved and, as Valve explained in a recent announcement, also leads to the application of some serious smackdown. "A user submitted a mace for Dota 2, and based on strong community ratings, the mace was made available in the game as 'Timebreaker' in Sithil's Summer Chest. 24,603 users spent money on keys to open the chest and ultimately receive the mace," it said. 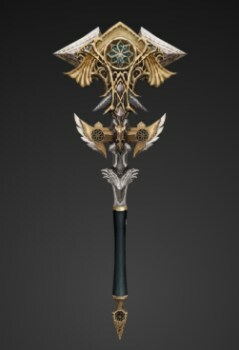 "Recently it came to our attention that this mace was in fact a copy of a mace from the game Aion. The copying has had negative consequences for everyone involved: users lost the mace and received an alternative weapon instead, the contributor has been banned and will lose out on any proceeds from the sale of the item, and it took a lot of time for us to investigate and remedy the situation." I don't know how much money the guy made off the mace (and will thus lose) but the part that really stings is the ban from Steam, which means the loss of all the games in his library. I would never condone plagiarism, but that's an awfully harsh punishment and one that I don't think necessarily speaks well of Steam. Transgressions must be punished, but stripping someone of games he's rightfully paid for is a little too heavy-handed for my liking. In any event, learn the lesson, kids, and learn it well: Don't steal other people's stuff and try to pass it off as your own!